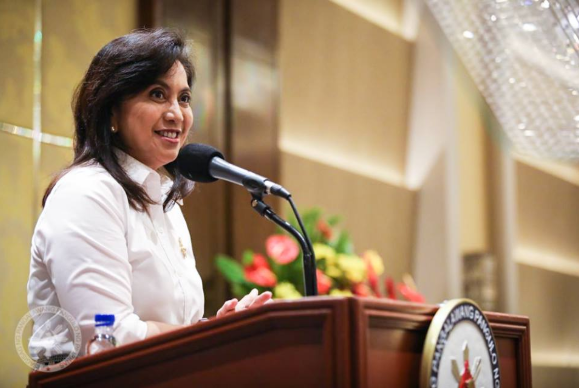 Manila, Philippines – Vice President Maria Leonor Robredo appealed to her critics on Saturday to leave her local projects out of politics. During a sideline interview after she attended the turnover of the Calabanga fish port, a project she iniated, Robredo said the important thing is the help reached those who are in need. “Ang importante nadala iyong tulong na kinakailangan (What is important is that the help needed was delivered),” she said. “Ang sa akin lang, pakiusap na una sana, kung hindi naman makakatulong, huwag na lang pakialaman iyong mga tumutulong, (If you cannot help, stop minding the business of those who want to help),” she added. “Ang pakiusap ko lang, basta kung sa serbisyo sa mga constituents, huwag nang pasukan ng pulitika (My plea is, when it comes to service to constituents, leave politics out),” she added. Robredo commented on the supposedly poor operations of the port being blamed on her, she said that the maintenance of the facility is the local government’s responsibility. The vice president said that she does not seek recognition out of the projects or aid she gives to communities. “Kahit pangalan ko, hindi nila makikita. Hindi naman ako after sa recognition (They will not see my name there. I am not after the recognition),” Robredo said in a statement.